Your typical/basic cake pop recipe is a box cake mix, baked as per the directions and then crumbed down and kneaded with some canned frosting. 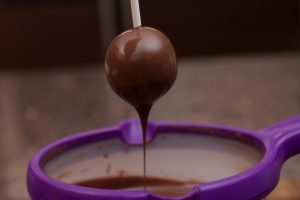 Of course you can get fancy and add homemade frosting or some other “Binder” or use your best scratch cake recipe, but for the most part cake pops are cake mixed with frosting until you get to a pliable dough you can roll into balls and dip into chocolate. 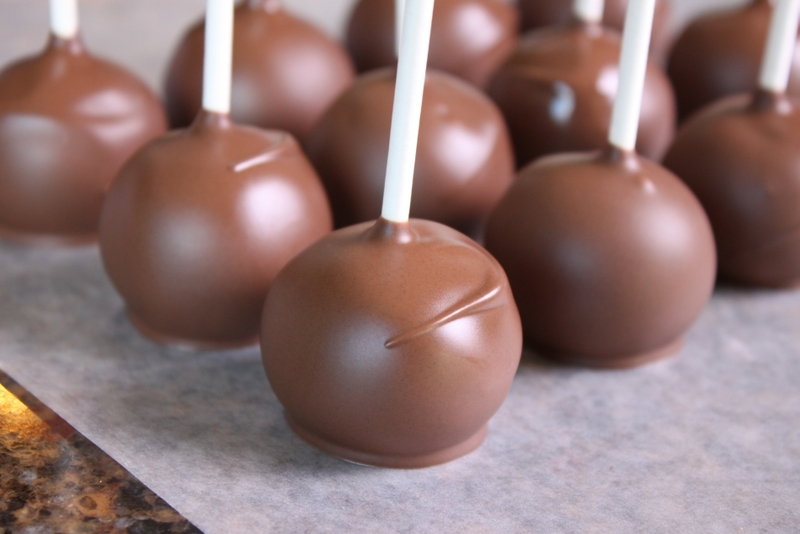 So how do I make these “diet” cake pops?! I omit all the frosting 🙂 OK, so they are still cake and they are still dipped in chocolate but just think of all the fat and calories saved by skipping the frosting!! What do I use instead you ask? The food processor!! (You can use a stand mixer with the paddle attachment too, it just takes longer.) If you put your baked cake into the food processor you will turn that cake into a pliable cake pop dough in just a couple minutes!! Just cake! ..your welcome! Take a look! 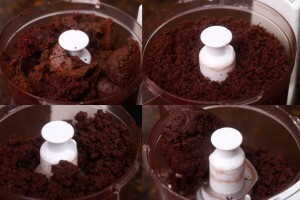 Here is my baked cake and when I put it into the food processor, these are the stages it goes through in just a couple minutes! Once it rolls up into a big ball in there, I turn it off and roll them into 1.25″ balls. To do this really fast I use the Easy Roller (can roll 21 at once), or New Mini Easy Roller which can roll 9! Take a look, a whole cake rolled up in a couple minutes (beats about a half hour if you ask me). From here, just dip them in your favorite candy coating and decorate! There are so many ways to decorate cake pops, and I have so many free tutorials on how to make them. ..and now that you know they are “diet” feel free to make them all! !